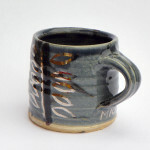 The glaze is like the sky on a stormy day, and it was a surprise when it came out the kiln as I hadn’t tested the glaze with these proportions of oxides. I was expecting green after using five percent iron to varying degrees of cobalt, but it works well. The darker patches of local slip always draw my eye and I wanted to make a feature of them so they would be noticed. 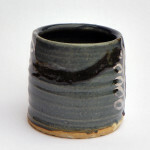 The work represents hours and hours of development with making and glaze chemistry. 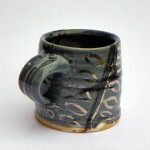 It is a mug I could enjoy sitting around my house as the winds roll off the sea, nursing a hot liquorice tea. The handle still needs development especially if I want to leave purposeful marks with my nail.